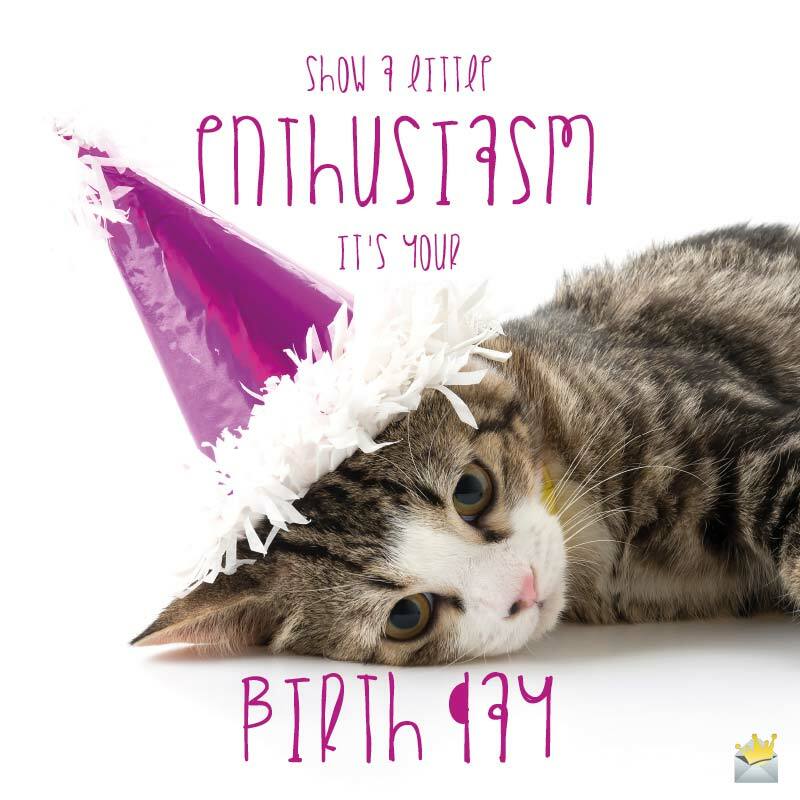 If your cat or that of a friend is celebrating its birthday today and you are looking for heartfelt messages to make the occasion extra special, you’ve navigated to the right place that can help you achieve that. 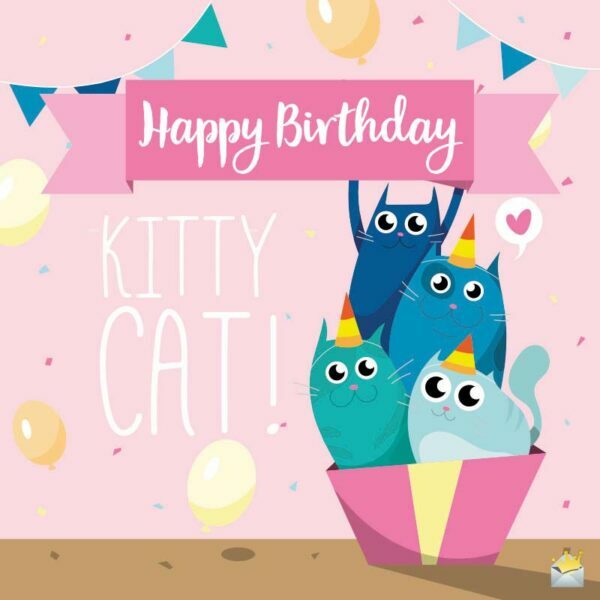 This page is packed to its brim with nothing but awesomely sweet birthday wishes for cats, so we are certain you are going to be spoilt for choice! I used to spend a lot of time all by myself until you came into my life and took away the depressing loneliness that was killing my soul. How can I ever thank you for that priceless treasure you have blessed me with?! Happy birthday! To the world’s cutest kitty, CATSNAME, I say, “Thanks for being such a treasure in my life”. Happy birthday, and may only sweet things come your way today. I am so proud to have such a beautiful and lovely cat like you as my pet. Happy birthday, my dear! My lovely and precious cat, you are one of the most special companions I’ve ever had in this life, and I want to take this Big Day in your world to wish you a very joyful birthday. I chose you to be my best friend because you are such a wonderful cat with cute purrs and round blue eyes. To my little tiger, I wish you a lovely birthday! CATSNAME, you are such an adorable cat to have as a pet. You make each day of my existence a truly amazing one, and that is why I have developed so much affection for you. Happy birthday. Today, I pledge to make this extraordinary day of yours one that is as sweet as your irresistible head rubs. Happy Big Day, my dear! If I could speak cat language, I know we will have a lot to talk about. You are such a lovely little kitty who always melts my heart all the time. Happy birthday, my beloved CATSNAME. I see you as a blessing from the Lord because you never cease to make my day such an incredible one. Have a delightful birthday, my most special furry friend. For all the joy and excitement that you bring me, I pray that you live long and set a record as the oldest and happiest cat on this earth. Wishing you an extra wonderful birthday, my dear little kitty!! It is always lovely to have a cat as a pet, but it is lovelier to have one who is as outstandingly special as you are. Happy birthday! Making me feel like the luckiest cat owner in the world is something really priceless. I thank you so much for this. Wishing you a fabulous day of birth! Everyone, please join me in wishing a gladsome birthday to the world’s most lovable cat! Spending time with my dear CATSNAME brings me so much happiness and joy. I know that many will see you as just an ordinary cat, but to me, you are more than just a simple cat, you are a special friend who I love and treasure so much. Have a fabulous day of birth, my dear! Today, nothing will bring me more joy than making you feel like the luckiest cat ever, and I believe you deserve every love and care that I give you. Happy birthday. It is astonishing the way you are able to reduce the stress in me after a long day’s work. I am beyond gratified to have you in my life. Happy birthday! The comforting noise of you purring is just what I need to make my day such a lovely and refreshing one. Wishing you a happy and comfortable one, my dearest cat! I have become a more loving and caring person just by having you in my life. I am grateful to the Lord for giving such an amazing pet to me. Happy birthday. The relief and joy I get from just petting you is an absolute delight. Happy birthday! Show a little enthusiasm, it’s your birthday! You are the cure to all of my anxiety problems, and this makes me never want to spend a day without you. I wish you a joyful birthday. Watching you play around boosts the energy inside of me and decorates my darkened skies with sunshine. CATSNAME, I am so elated to have such a treasure like you in my life. Happy birthday. You have improved the quality of my life and have made my house a happy home. I can’t thank you enough for your great companionship and love. Happy birthday, cat! My hearty congratulations to your remarkably pretty little kitty as she celebrates her birthday on this beautiful day! I have just one sincere wish for her on this special day. May she forever swoon in joy. There’s absolutely not a shred of doubt in my mind that your cat is one of the cutest pets my eyes have ever seen. I hope every moment of her birthday is as sweet as she is to your heart and the hearts of all who love her. Wishing your lovely furry friend a super duper happy birthday. May he/she continue to bring warmth and happiness into your world. Personally I don’t think your cat’s birthday is the only time we should celebrate him/her. CATSNAME is so adorable that he/she needs to be celebrated every day. You are lucky to have him/her as a pet and a companion. May his/her Maker abundantly bless him/her today! Sending my heartiest birthday greetings and blessings to your dearest CATSNAME! Thank him on my behalf for adding so much color into our lives. For your pet cat’s birthday, I wish it an absolutely beautiful day filled with countless happy meows – and may the joy he/she fills today spread to every day of his/her life. Happiness is having a bright and warm pet like your beloved CATSNAME. On his/her special day, may all the things that bring him/her bliss find their way to his/her heart. He/she deserves this for being an absolutely lovely pet. Wishing CATSNAME the best of luck on this beautiful day that she made her entry into the world. May happiness and good luck surround her…today and forever. Happy birthday to CATSNAME! May his/her birthday bless her with a life that is full of countless beautiful colors and happy moments. Here’s to your treasured kitty’s special day! I hope she’s blessed with the happiness and sunshine she brings into your world. Wishing your one and only darling cat a birthday that is as beautiful and radiant as the colors of the rainbow. May he/she always feel happiness and love. Hurrah! Your fabulously sweet and cute CATSNAME becomes a year older today! For being such an incredibly wonderful pet, may happiness completely take over his/her heart on his/her birthday and on all the days of his/her life. Happy birthday to your absolutely adorable furry little friend! It’s amazing how every year, he/she is blessed with more beauty and grace. Wishing your wonderful and sweet cat an amazing birthday. May all the beautiful things that make her happy, healthy and strong pay her a visit on this special day and stay with her until the end of time. On the birthday celebration of your sweet CATSNAME, I pray life will make her the happiest pet in the world.